Be the first to share your favorite memory, photo or story of ELSA. This memorial page is dedicated for family, friends and future generations to celebrate the life of their loved one. 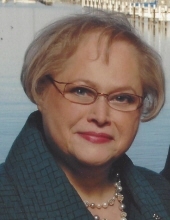 ELSA MARIE PAVLIK (nee Felgemacher) born April 6, 1943, passed away March 26, 2019, at her home. She is survived by her husband, Thomas C. Pavlik, her son, Thomas C. Pavlik, Jr. (Sarah), her sister Olga Marin (Craig), sister-in-law Marilyn Ruddy (Ray), brother-in-law Bill Pavlik (Suellen), nieces and nephews, Gabriel Marin, Raymond Ruddy, Kevin Ruddy (Christine), Carolyn Malloy (Tim), Kara Kelly (Jason), Mia Koch (Doug) and Ben Pavlik (Kristen), and several great-nieces and nephews. Elsa was born in Cleveland to Heinrich and Olga Felgemacher, who preceded her in death. Elsa's life mission outside of her husband and son included enhancing the lives of others through her volunteer work and support of Catholic Charities, Christ Child Society, DePaul Home, St. Christopher Parish, St. Ignatius High School (where she was a member of the Board of Trustees), St. Edward High School, St. Augustine Academy, Sacred Arts of the Diocese of Cleveland, The Great Lakes Shakespeare Festival, Clague Playhouse, and more. She was a friend, supporter and inspiration to many. Funeral Mass on Saturday, March 30 at 11:00am, at St. Christopher Church, 20141 Detroit Road, Rocky River, 44116; entombment at Holy Cross Cemetery. FRIENDS MAY CALL AT THE McGORRAY-HANNA Funeral Home of WESTLAKE, 25620 Center Ridge Road, Friday, March 29, from 4-7 PM. Memorial contributions may be made to St. Christopher Church, St. Ignatius High School, St. Edward High School or Catholic Charities. "Email Address" would like to share the life celebration of ELSA MARIE PAVLIK. Click on the "link" to go to share a favorite memory or leave a condolence message for the family.